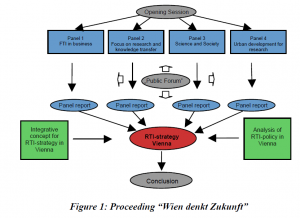 In 2006, the City of Vienna initiated a far-reaching, open strategy process on the orientation of its future research, technology and innovation (RTI) policy. The aim was to develop, in a participatory process, a comprehensive strategic framework and concrete proposals for municipal RTI policy actions until the year 2015. By then, Vienna is aiming to be among Europe’s leading metropolitan areas in research, technology and innovation, as the hub of a network of research locations in the Central European Region (CENTROPE). The objectives, challenges and fields for action to be tackled in order to reach this position were translated into a set of concrete measures, some of which are to be started in 2008. Vienna is the key centre for science and research in Austria as well as in the wider central European area to which it belongs. With its “twin capital” Bratislava being only 60 km away, it occupies a unique position in Central Europe. As mirrored in international benchmarks, the Austrian innovation system has gone through a phase of fast growth of R&D expenditures and internationalisation. Austria is increasingly recognised as one of the leading European countries in research. Austria has accomplished major structural reforms, affecting universities as well as research funding bodies, many of which are located in Vienna. Simultanously, several Austrian regions have initiated or reinforced their RTI policies. Vienna already launched an active RTI policy in the early nineties and was now confronted with the necessity to revisit the institutional and RTI policy landscape. At the same time, new challenges were identified that would have to be tackled in order to keep pace with the international developments in science, technology and innovation, with new employment patterns and with the need to further upgrade research and innovation performance. In 2006, it was therefore decided to initiate a process of strategic debate, bringing the growing number of diverse actors together in an open and selfcritical debate. The strategy process was built on solid ground. In addition to a number of specific studies, it drew on the results of the largescale research programme “Systems Research in the Urban Area” that provided the analytical groundwork and took first exploratory steps towards identifying future challenges to the RTI policy of the City of Vienna. The results of the programme later on served to fuel the debates in the different expert panels in the strategy process phase. The goal of this comprehensive research programme was to identify scientifically founded observations and analyses to underpin the development of an integrated, future-oriented urban research and innovation policy. Initiatives in this urban policy area were expected to contribute to enhancing the competitiveness of firms in the city, thus fostering the socio-economic development of the Vienna metropolitan area by giving those impulses a regional government can specifically provide. Central to the research programme was the combination of different perspectives on the current situation of the urban innovation system. Excellence4me: Vienna as a centre of science. The process started with a kick-off event (opening session) at City Hall with prominent proponents from politics, academia and business and several hundred participants. After the opening session, the panels established themselves and each panel met between three and five times over the following months. In addition, regular inter-panel meetings and meetings with the supporters were held throughout the whole period. A website served to document the discussion and also offered the public an opportunity to contribute to the process with own ideas and proposals throughout the whole period. The participatory nature of the strategic process is demonstrated by involving more then 100 players from various areas in the panelwork. Additionally, major public events were organized at the beginning, half-way through and at the end of the process in order to gather further input from a broad range of stakeholders, complemented by interactive tools made available on the accompanying website (www.wiendenktzukunft.at). rate of female researchers in the business sector is to increase by 100 per cent. Making effective use of the potential for research, technology and innovation by creating adequate conditions for young people, irrespective of their origins, to pursue a successful career as scientists and researchers. Enhancing RTI quality and visibility with respect to international competition for investors. Embedding RTI into society: providing space and occasions for public discussion about RTI, its opportunities and challenges. Accelerating the dynamics in RTI by creating adequate infrastructure. Integrating Vienna RTI within European networks and strengthening co-operation within the CENTROPE region in order to create a common RTI area that will successfully compete in Europe and in the world. Within its jurisdiction, the City of Vienna can provide stimuli for achieving the identified goals. Options for translating these goals into specific measures can be conceived along the lines of the main determinants of innovation ranging from push factors in the area of science (e.g. R&D subsidies, selective subsidies complementary to national subsidies), through acceleration of the transfer process (selective measures such as licensing initiatives, venture capital), to pull factors in the area of socio-economic demand or application potential on the demand side. Human resources – Bright Minds for Vienna: The goal of activities in this field is to make better use of the city’s enormous human resource potential. Various activities will serve to improve the prospects and conditions for highly qualified young scientists, with a special focus on gender issues and populations that have been neglected in the past (e.g. university graduates with a migration background). Key areas – profile and relevance: Specific thematic areas that are both relevant and visible are to be supported, building in particular on the existing key areas of life sciences, information and communication technology and creative industries. In addition, the development of a number of new avenues of research and innovation is being promoted. Research and the city – communication, learning and public awareness: The three terms form a catchphrase to express the serious interest in strengthening the critical public dialogue about RTI, both within Vienna and on the international stage. By means of a new set of measures called “Vienna research in dialogue”, a critical and continuous exchange of knowledge about RTI with the citizenry is to be fostered. Vienna as a hothouse for research and innovation – facilitating new developments. Further improvement of working conditions for scientists and creative individuals are called for by providing local networks as breeding grounds for invention and creativity. A European location for research and innovation – Vienna as a hub for international networks: Vienna is to be established as the centre of international research networks, and of networks in the CENTROPE region in particular. In this context, Vienna’s network-based location of research and innovation will be further strengthened. Based on the objectives, challenges and measures identified during the strategic process “Wien denkt Zukunft”, several concrete proposals for new projects or initiatives were developed in the five fields of action. Six of these projects have been prioritised (“kick-off projects”) and are likely to be implemented in the coming two to three years (see Figure 2). For the year 2008, the initial three projects have been endowed with approximately 14 million euros. Under the title of a “Keynote Programme” for the specific fields of research in the humanities, the social and cultural sciences (on the side of the already well established programmes for life sciences, information technologies and the creative industries) will be actively promoted. One of the first calls in this area was scheduled to start March 31. Expansion of the “Research and the City” campaign. Under the slogan “Vienna research in dialogue”, the City will address essential contemporary and future issues in the field of science, research and technology. Communication between the various special interest groups and organisations will be encouraged and strengthened. In revising the City of Vienna business promotion principles – “ZIT 08plus” – more attention will be given to crosscutting issues of RTI policies, such as promoting innovation in the service sector, encouraging research cooperation and gender mainstreaming.